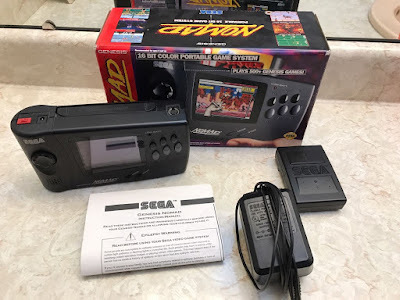 Coming straight from Sega's weird (and not particularly successful) era, the Sega Nomad or Sega Genesis Nomad is a handheld version of the classic 16-bit Genesis console with a lovely little colour LCD screen and not as lovely battery life. Handily, it plays the exact same cartridges the home console uses, and is thus rather bulky. Oh, and it's quite rare too, especially when coming in its original box as is the case with this Sega Nomad eBay auction. The console on offer comes in its box with manual, PSU, and everything pictures above, has been tested, and is in apparently fine condition.